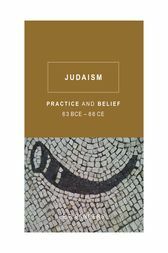 In this now-classic work, E. P. Sanders argued against prevailing views regarding the Judaism of the Second Temple period, for example, that the Pharisees dominated Jewish Palestine or that the Mishnah offers a description of general practice. In contrast, Sanders carefully shows that what was important was the “common Judaism” of the people with their observances of regular practices and the beliefs that informed them. Sanders discusses early rabbinic legal material not as rules, but as debates within the context of real life. He sets Pharisees, Sadducees, and Essenes in relation to the Judaism of ordinary priests and people. Here then is a remarkably comprehensive presentation of Judaism as a functioning religion: the temple and its routine and festivals; questions of purity, sacrifices, tithes, and taxes; common theology and hopes for the future; and descriptions of the various parties and groups culminating in an examination of the question “who ran what?” Sanders offers a detailed, clear, and well-argued account of all aspects of Jewish religion of the time. E. P. Sanders was Professor of Religion successively at McMaster, Oxford, and Duke Universities and is a fellow of the British Academy and of the American Academy of Arts and Sciences. He has written numerous landmark books.